Part 2: Hidden Antennas for HOA restrictions? EDIT 2/7/2016: I have been asked for close ups of the MulitCam Commo sock cover that I bought through Tactical Concealment. That photo is added down in the body of this article. I have a confession to make…….. I live in a HOA! I know most hams say what the hell you did that for, you knew you could not put up a 60 foot tower. 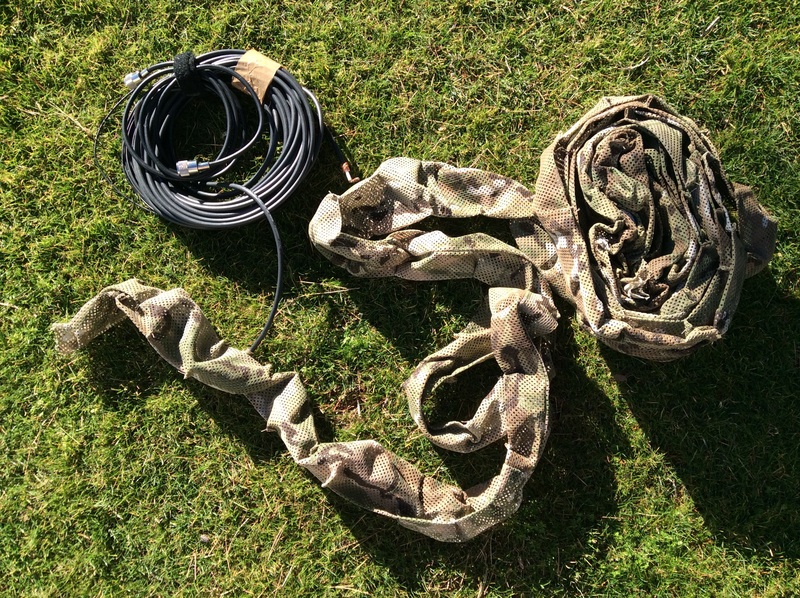 Turn in your FCC license…..
Well I am here to tell you that even in a HOA you can have antennas that are very stealthy and be usable for anything from local work in UHF/VHF but also DX. Now are these antenna options as good as a giant tower with a beam, well no but they can be effective to very effective. I will cover what I did to get a signal out, then I will cover other options I know about but have not tried yet. I have been operating out of my current QTH for over five years with good success. 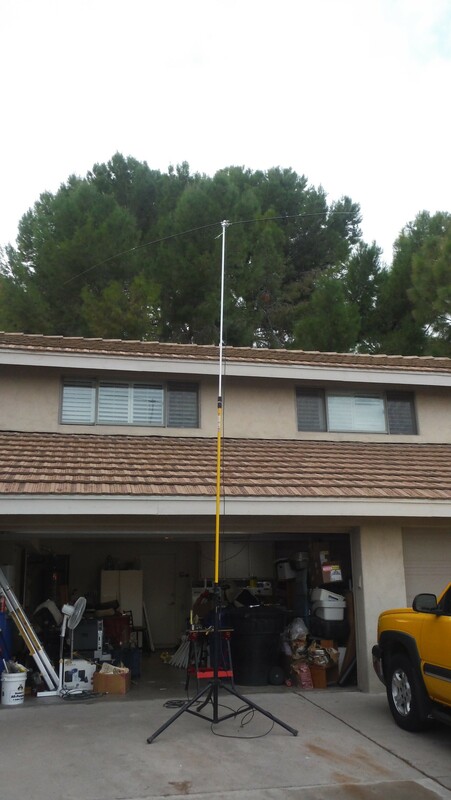 When I started with my Yaesu 857D, I needed a simple set up from my antennas. In order to keep the costs down, I went with mono band PAR/LNR Precision End Fedz wires in 20 & 40 meters. There are two antennas in this photo can you find them? These antennas work great and do not need a tuner. 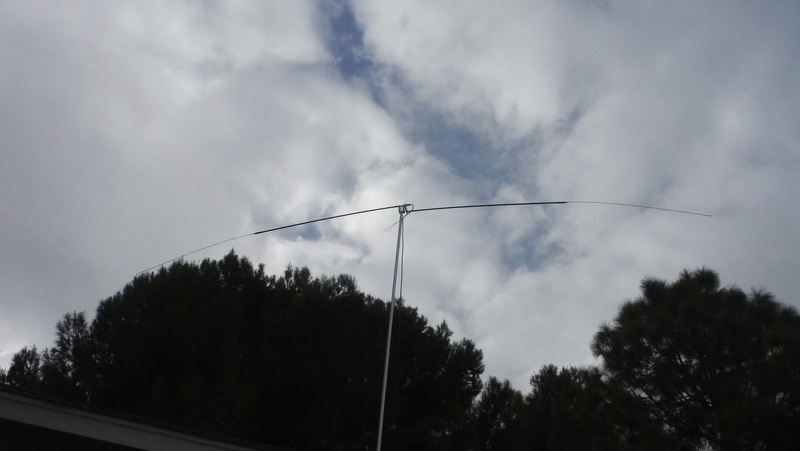 Now I can hear the masses now saying “you could/should have built a resonant dipole….” “Real HAMS don’t buy antennas”…..”Turners are a crutch resonant antennas are the only way to go”…. And I am sure you can come up with others as well. 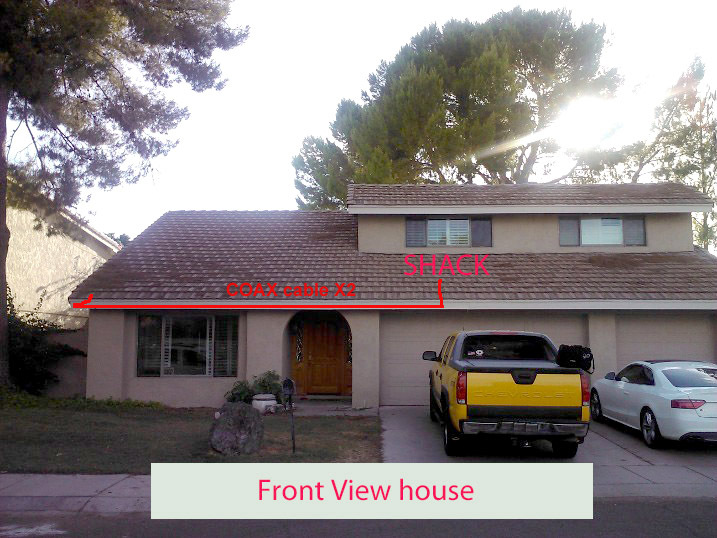 For me my shack is on the second floor of the house facing the street. No way to get stealth ladder line in here if I wanted and still have lighting protection/arrestors and a grounding rod. The ARRL Section Manager Thomas Fagan came by my house and looked over my set up and I told him my options to use the large Alderica Pine tree in the front yard as cover for the wire antennas. The PAR/LNR wires are very thin and black and are hard to see even for the sidewalk 30 feet away. 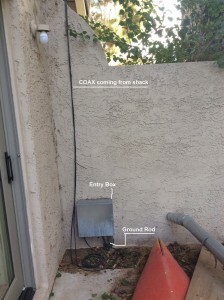 The COAX runs out of the shack wall facing the street and into the garage. From there they go through the vent holes in the soffit boards under the eves, across the front of the house and into the back yard behind the fence. I had my tree service guys climb up the tree and run the 30+ foot 20 meter vert and the 60+ feet 40 meter wires. The 20 meter went straight up and terminated with the end insulator wrapped with 550 cord around a big branch. The 40 meter wire is kind of an inverted L as it goes up about 45 feet, then sideways over a few more limbs with it is tied off. 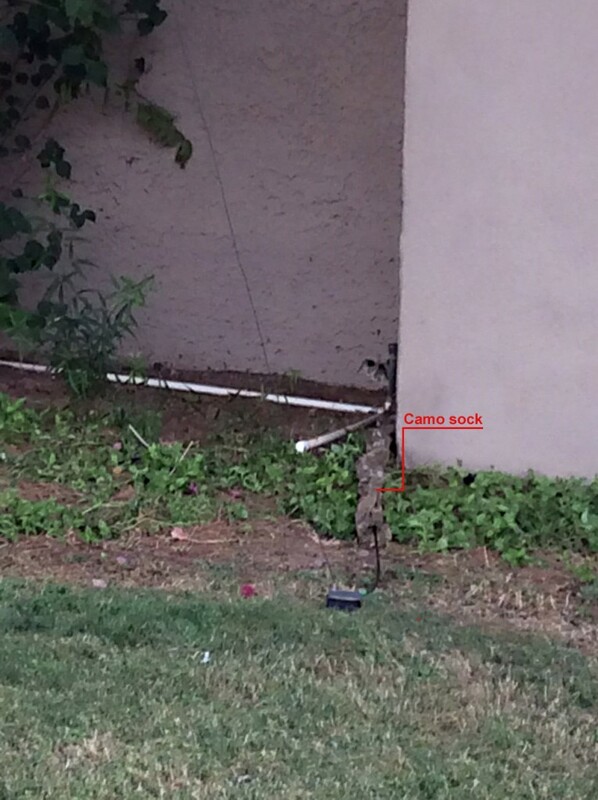 To hide the feed lines coming through the block fence into the front yard, I had my friend at http://www.tacticalconcealment.com/default.cfm make me a MultiCam camo mesh sock to cover the feedline coming through the fence into the front yard. Its pulled out here to make it visible for the photo. You can see the open cells in the mesh which allow you to weave pine straw or jute type fibers in to the mesh to help it blend into any environment. All of that can be purchased at TC on the web link above. If you have further questions on thos material post a message below. The back side of the fence is an entry box made by http://www.kf7p.com/KF7P/EntrancePanels.html. This allows me a way to keep RF out of the shack and provide a close to the antenna ground rod with lighting arrestors. You can see what the insides look like on his site. Best entrance panels around!!!! This is what the inside of one of KF7Ps entrance panel looks like. 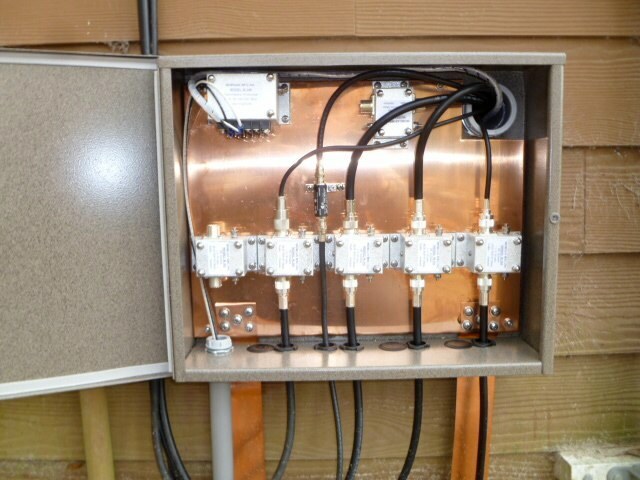 This one is from WA2LLN off of the KF7Ps website, since mine only has 2 cables running into it I thought I would show this one as it shows the full capability of these panels. I had the 20 running straight up to trunk but with the tree being 3 feet in dia, a lot of the signal was being blocked by the tree, so I had it lowered so that I can pull the base of it out in the front yard and run it as a “sloper”. I do this in the evening/night for obvious reasons. The PAR/LNRs are “directional” when sloped and has a main lobe in the direction of the match box at the bottom. I put this about 3 feet off the ground from this position I am aiming it from SW to NE from my AZ QTH. 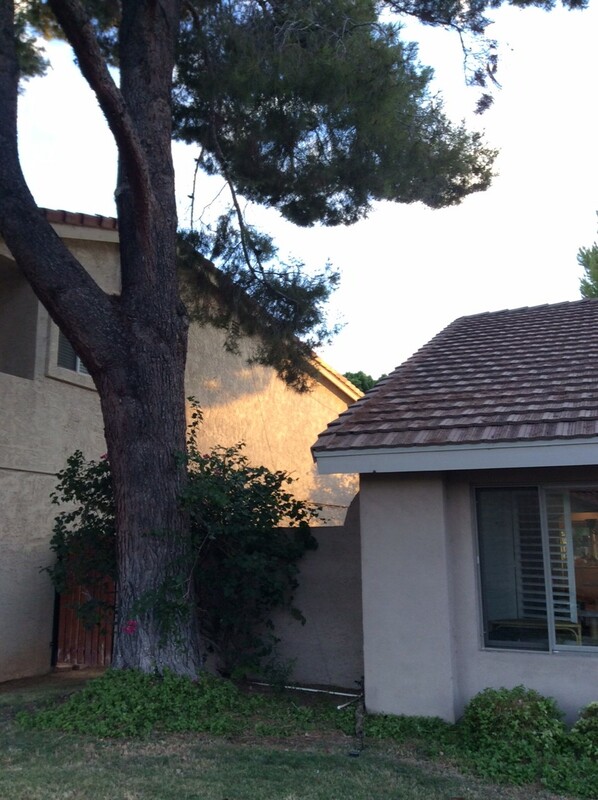 Is this optimal, no but I can get on the air and don’t get harassed by the HOA as they do not own night vision……YET. 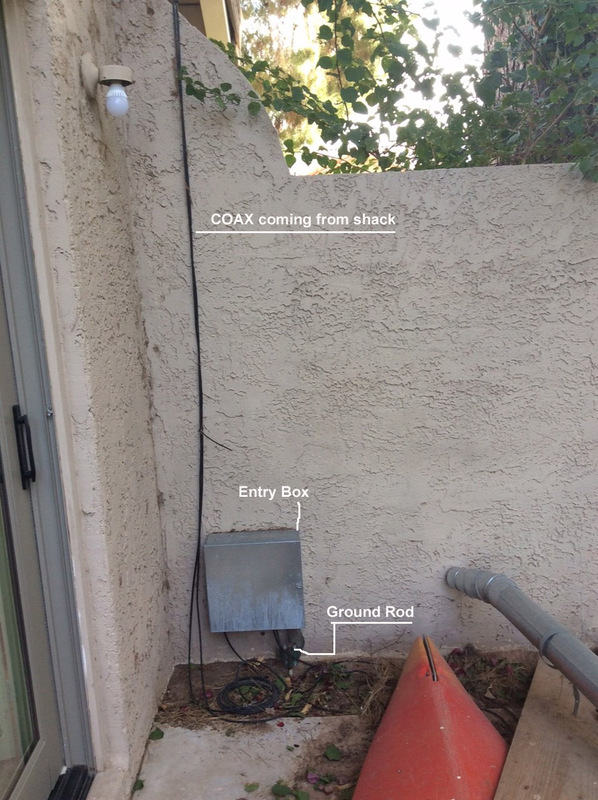 WHAT ELSE IS THERE FOR HOA ANTENNA SETUPS? Hams have radiated from metal rain gutters, metal fences, wooden fences with a wire running around the perimeter, a HF mobile antenna on their vehicle connected to the shack via coax running out of the garage and many other methods. The most popular is a Flagpole antenna. An HOA cannot stop you from erecting a flagpole and flying Old Glory. Several companies make flagpole vertical antennas. If you have trees in your yard, it helps as you can run a “random length wire” of a dipole around you property attaching it to trees. You can buy bulk wire from HRO(Ham Radio Outlet) or even Amazon and run anything that will work. The goal is to get some radiation out. It does not have to be perfect, just try something and see how it works. If anyone has any unique HOA Stealth antenna set ups let me know. Copyright 2015, All Rights Reserved. All content on this site is subject to copyright law and cannot be reproduced in part or in its entirety without express permission from the original author. In almost all cases, this will be me, AD. Contact me at info@preparedham.com for permission. If you would like to include a short snapshot of my article (the preview paragraph) by way of RSS feed with a link to the rest of the article, please feel free to do so, and I thank you if you do.